The Global Volcanism Program has no activity reports for Garibaldi Lake. The Global Volcanism Program has no Weekly Reports available for Garibaldi Lake. The Global Volcanism Program has no Bulletin Reports available for Garibaldi Lake. A group of nine small andesitic stratovolcanoes and basaltic-andesite vents in the scenic Garibaldi Lake area immediately north of Mount Garibaldi was formed during the late Pleistocene and early Holocene. The oldest stratovolcano, The Black Tusk, formed between about 1.3 and 1.1 million years ago (Ma). Following glacial dissection, renewed volcanism (0.21-0.17 Ma) produced the lava dome and flow forming its summit. Other Pleistocene vents are located along and to the west of the Cheakamus River. The Cinder Cone, to the east of The Black Tusk, produced a 9-km-long lava flow during the late Pleistocene or early Holocene (0.04 +/- 0.04 Ma). Mount Price, west of Garibaldi Lake, was formed in three stages dating back to 1.1 million years, the latest of which produced two large lava flows from Clinker Peak during the early Holocene that ponded against the retreating continental ice sheet and formed the barrier containing Garibaldi Lake. 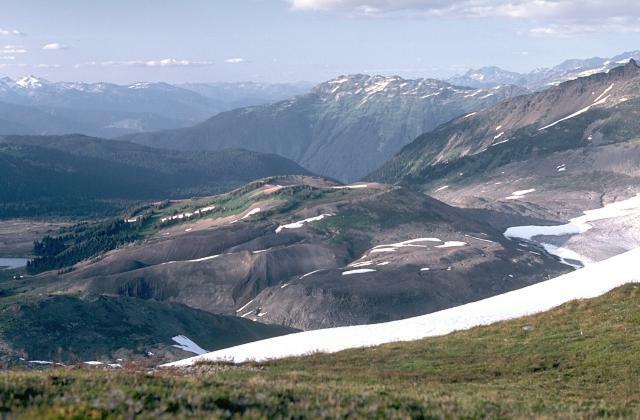 The Table, a steep-sided subglacial tuya south of Garibaldi Lake, was also formed during the early Holocene. Green N L, 1990. Late Cenozoic volcanism in the Mount Garibaldi and Garibaldi Lake volcanic fields, Garibaldi volcanic belt, southwestern British Columbia. Geosci Can, 17: 171-174. Mathews W H, 1958. Geology of the Mt. Garibaldi map-area, S.W. British Columbia. Geol Soc Amer Bull, 69: 186. The Global Volcanism Program is not aware of any Holocene eruptions from Garibaldi Lake. If this volcano has had large eruptions (VEI >= 4) prior to 10,000 years ago, information might be found on the Garibaldi Lake page in the LaMEVE (Large Magnitude Explosive Volcanic Eruptions) database, a part of the Volcano Global Risk Identification and Analysis Project (VOGRIPA). There is no Deformation History data available for Garibaldi Lake. There is no Emissions History data available for Garibaldi Lake. 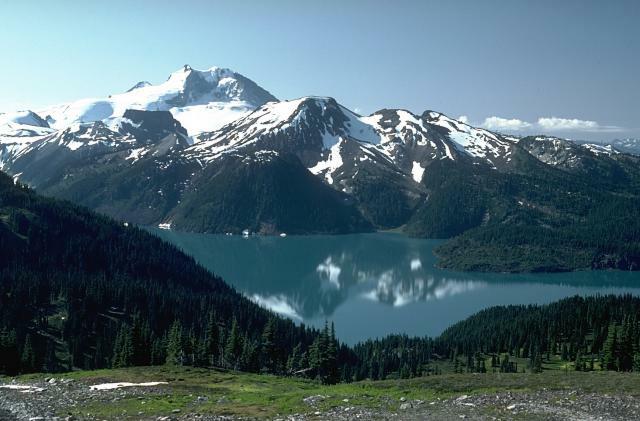 The Garibaldi Lake volcanic field consists of nine small stratovolcanoes and volcanic vents of Pleistocene to Holocene age around scenic Garibaldi Lake, seen here with Mount Garibaldi in the background. Mount Price, in the center of the photo, is a small andesitic stratovolcano. 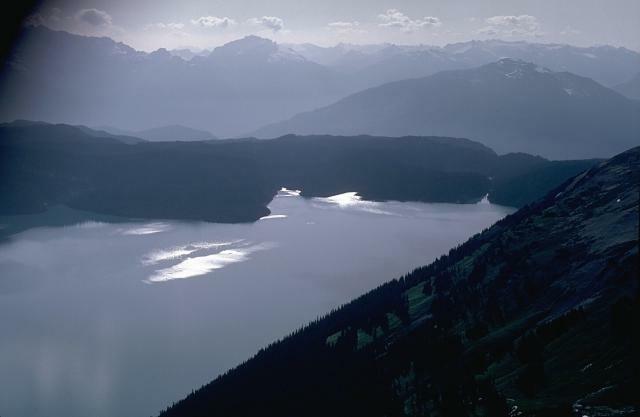 Clinker Peak, on its west flank, produced two Holocene lava flows that dammed Rubble Creek at the right-hand margin of this photo, forming Garibaldi Lake. The low ridge in the center of the photo consists of early Holocene lava flows that originated from Clinker Peak on Mount Price to the south (left). The lava flows ponded against the retreating continental glacier that filled the Cheakamus River valley to a depth of 1000 m, and formed a barrier that created Garibaldi Lake. 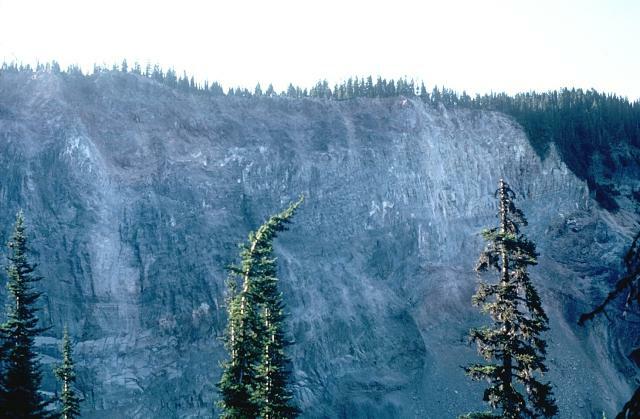 The unvegetated cliff along Rubble Creek is the margin of the early Holocene lava flows that created Garibaldi Lake. The steep-sided lava-flow margin formed when the flow ponded against the retreating continental glacier filling the Cheakamus River valley. The oversteepened flow margin has been the source of several landslides down Rubble Creek, leaving a scarp known as The Barrier. 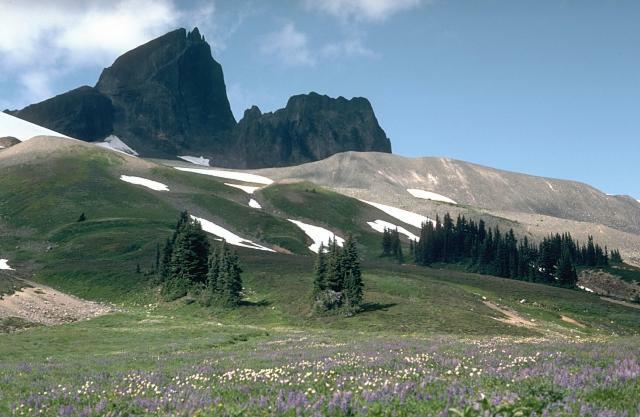 The spectacular Black Tusk, towering above a flower-covered mountain meadow, is a glacially eroded lava dome from the earliest stage of activity of the Garibaldi Lake volcanic field about 1 million years ago. The light-colored ridge to the right is a glacial moraine. The irregular mound in the center of the photo is Cinder Cone, a late-Pleistocene cone of the Garibaldi Lake volcanic field. The pyroclastic cone was formed during two periods of activity, the lastest of which produced a lava flow down the glaciated valley to the north. There are no samples for Garibaldi Lake in the Smithsonian's NMNH Department of Mineral Sciences Rock and Ore collection. Large Eruptions of Garibaldi Lake Information about large Quaternary eruptions (VEI >= 4) is cataloged in the Large Magnitude Explosive Volcanic Eruptions (LaMEVE) database of the Volcano Global Risk Identification and Analysis Project (VOGRIPA).